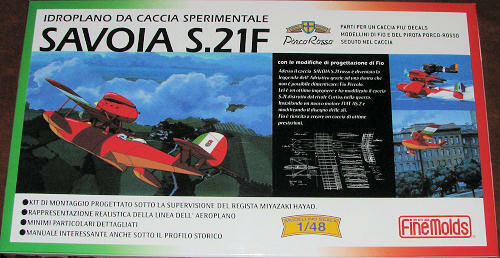 NOTES: From the movie "Porco Rosso"
A history will be difficult, for I could find nothing on this aircraft and though there seems to be a history in with the instructions (written in Japanese), it is apparently a fictitious aircraft. 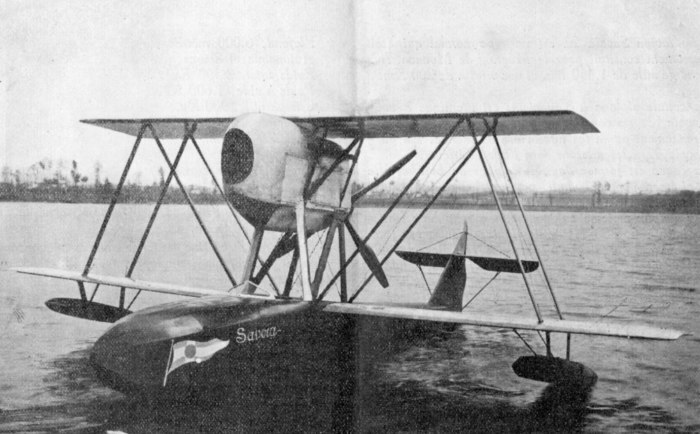 It sure looks the part of a 1930s Savoia flying boat fighter, and there is precedence for such a thing as both Italy and Austria flew these types during WWI. But that was about as far as things went. I would be remiss to mention that both the British and the US flew prototypes of full hulled jet fighters in the 50's but again, it was a dead end and went nowhere. This particular aircraft is probably the inspiration of Hayao Miyazaki's fertile imagination and is the mount of the hero in Porco Rosso (which I believe translates to 'red pig') in one of his cartoon epics. In this movie, Porco is a bounty hunter who is often hired to protect Adriatic shipping against seaplane pirates. There is much additional excitement as he has his aircraft rebuilt in Fascist Italy, where he is a wanted man (pig). I won't blow the rest of the movie as it really is superbly done and if you aren't afraid of animation for your entertainment, you and your kids will thoroughly enjoy this one. 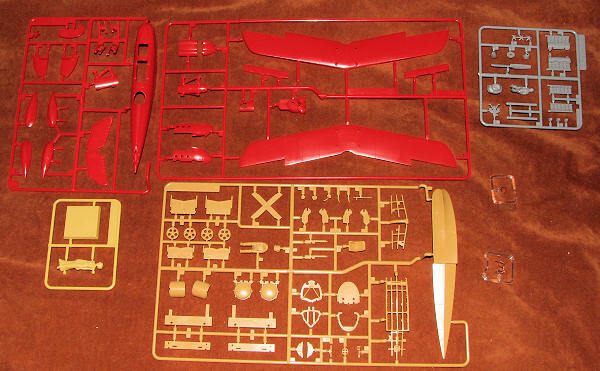 Of course, it is molded in red plastic. So much to help you with the painting of the kit. Actually, the molding is quite well done with engraved panel lines, a teeny bit of flash and nicely done fabric representations. Since the plane is mostly wood, a clean finish is to be expected. The kit is presented in its post rebuild form with the newer Ghibli engine and engine cowlings. Also, it has the newer wings that are swept back a little bit more than the original to give more speed. To fit in with the newer plane, there is quite a bit of interior detailing, including a well done cockpit, the large fuel tank that we never see in the movie, as well as a single machine gun. The other was removed to put a seat of sorts in there for his designer passenger. The updated forward hatch with small windscreen is also part of this upgrade. You get three figures in this one. Porco, his passenger and his lady love, Gina are all included and they are very well molded. Gina comes with her own base. The kit also includes a beaching trolley that one only sees when the aircraft is being rebuilt. However, it provides an excellent display stand. I should mention that the plastic for the	lower part of the kit, the beaching trolley and many of the	 interior bits are all in tan plastic, ostensibly to improve painting. This would account for the engine and machine gun being done in grey. Instructions are in Japanese, though easy enough to follow. The paint chart is also in Japanese, but at least there is a column in English to help you out. It is basically in 'Red Madder' with wood undersides and the decal sheet has this wood as a decal for the underside of the wing floats, a nice touch. Markings are for a single aircraft. There are a bunch of decals that you probably won't use and their placement is not shown in the instructions. It will be interesting to see how well the white holds out against all that red paint! For fans of Miyazaki films or those who just want an interesting looking aircraft, this is one you should really consider. I know I'll build it as I have practically got the movie memorized! My thanks to Hobby Link Japan for the preview kit. Get yours at the link. Late Note. I have found that there was an S.21, but, aside from the basic fuselage/tail, it is quite a different beast from the movie. Here is a photo. If you would like your product reviewed fairly and fairly quickly please contact the editor or see other details in the Note toContributors.